'Tis the season for one of the most tasty fruits ever: pomegranates. Pomegranates are to the fruit world what we might call auto-cockblockers: they're so difficult to peel and extract the fruit that it's like they purposefully evolved that way... hard-to-get, yet strangely making them more enticing, attractive... clever, but not more clever than us! Thankfully, there is the Internets, and though it's 99% littered with garbage, the rest is actually useful; many bloggers/vloggers have shared many different ways to get to the pomegranate fruit (WHICH, technically-speaking are NOT the seeds, rather are the arils (or outgrowth) that contain the seeds). The easiest way I have found so far is whacking the fruit with a spoon (or in my case, was a tiny frying pan stolen from a tiny dwarf). Score the pomegranate fruit all the way around its "equator" (crosswise, I guess). Don't slice too deeply into the fruit. A pomegranate split in half. O, the horror! Take one half and loosen the arils from the membrane (mesocarp) all the way around by gently pressing on the sides from the outside. Repeat massage with other half. 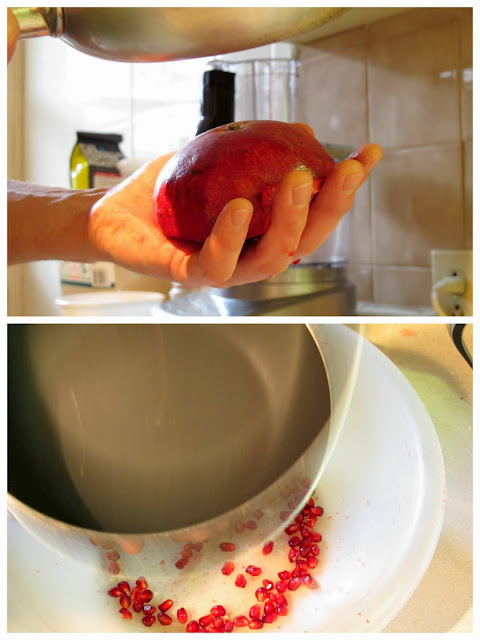 Hold the pomegranate half from underneath over a bowl with the open side downwards and smack the outer skin all the way around until all the arils have dropped into the bowl. Repeat the abuse with other half. And you're done. No peeling, no post-pom-peeling countertop murder scene (well, only a minor one at least). Aftermath of the Pomegranate War of 2013. You could avoid this if you want by putting a dishcloth under the bowl.